There must have been some magic in the old silk hat they found. For when they put in on his head, he began to dance around. From solid stone, to flesh and blood, thanks to the rat talisman. This particular brand of Ancient Artifact (brought to you by Trope Co.) has the power to give life. In many cases, it is compared to that of its brain. In other cases, it acts as its heart. More often than not the life it creates requires constant contact with the artifact, becoming its glaringly obvious weak-point. Since corpses could count as inanimate objects, these artifacts could be used as a tool for Necromancy. If the user is already living, it could act as an Immortality Inducer, prolonging their souls's tether long after when they should have died. If the object is animate but otherwise non-sentient like a robot or a golem, that the Artifact will compel it to develop a will of its own and to start questioning its existence. At best you'll make a new friend, at worst it will turn on its creators in existential rage. Rule of Drama dictates that they will rip out the Artifact from their physique - killing them instantly - when this rage reaches its boiling point. Sub-Trope of Ancient Artifact, Creating Life, and Animate Inanimate Object. Compare with Heart Drive, Instant A.I. : Just Add Water!, and Soul Jar. Contrast with Artifact of Death, an object that kills the user instead. One issue of Marvel Comics Iron Man has The Hero and Doctor Doom transported to medieval Camelot. While Iron Man becomes the guest of King Arthur, Doom seeks counsel with Morgan La Fey. Morgan is a powerful sorceress, who has a chip from the blade of Excalibur. She uses it to raise a battalion of corpses, all those felled by Excalibur at some point. Doom agrees to command this undead force in a coup d'etat against King Arthur. Notably, once Morgan makes a tactical retreat with this chip, her "army" topples to the ground, deader than ever. Frosty the Snowman has the titular character's old silk hat, for when the children placed it on his head, he began to dance around. The Mind Stone from the Marvel Cinematic Universe is one of the six Infinity Stones. As its name implies, the Mind Stone has various powers involved with the mind. It possesses a core that is comparable to neurons firing in a human brain. While in Loki's Scepter, it grants the wielder the power to control others, and even imbuing them with some level of knowledge while under this thrall, as it "opened the eyes" of Clint Barton and Erik Selvig, showing them visions and granting them special knowledge they can use. On its own, it seems to be able to imbue sentience onto artificial intelligence, two notable examples being Ultron and Vision. The Tablet of Akhmenrah from Night at the Museum is an ancient Egyptian tablet that brings to life the various exhibits at the New York American Museum of Natural History. The Allspark from Transformers gave life and sapience to both the Autobots and the Decepticons, but was lost during a battle between the two factions. It just happens to be on Earth, where efforts to keep it away from Megatron inadvertently bring the Allspark near a vending machine, then an Xbox game console. Both inert devices suddenly sprout limbs and blades and start attacking people. The 1984 film Supergirl has a device called the Omegahedron, which sustains some survivors of Krypton's destruction in a pocket dimension. Zaltar appropriates it to show off, and Kara uses it to create an artificial dragonfly. Much later, The Villain gets hold of it, and creates a golum from shadows to oppose Supergirl. Lara Croft: Tomb Raider visits an ancient temple, seeking the key to the Wheel of Time. Part of the elaborate idol mechanism involves a pendulum breaking an orb filled with animating fluid that brings various guardian statues to life. These statues then go after Lara and her party. After Shadow wins mad Sweeney's lucky coin in a bar-fight in American Gods, Shadows discards it on his wife Laura's grave. The coin imbeds itself into her corpse and winds up bringing her back to life, albeit as a Type I zombie on the Sliding Scale of Undead Regeneration. As referenced in the quotes, Frosty the Snowman was brought to life by an old silk hat. However, being made of snow, he has to leave when the weather turns warm. In Jewish folklore, a golem is animated by writing the name of God on a piece of paper and putting the paper in the golem's mouth or on its forehead. Karn from Magic: The Gathering is a silver golem who was created by Urza and Barrin as a sentient being capable of feel emotions and decide on his own destiny. He also has the power to animate other artifacts like him (he's considerated a Legendary Artifact Creature in-game), as seen in "Karn, Silver Golem " card, that allows the player to convert its artifacts into artifact creatures until the end of the turn. BIONICLE: The first time the Ignika used its power was cursing a Great Being so that inanimate objects around him come to life and cry out their needs to him, with the unfortunate effect of being permanent. In Touhou Kishinjou ~ Double Dealing Character, the Miracle Mallet can cause tools to prematurely transform into tsukumogami. Three of them achieve human form and are fought as bosses; another three are weapons wielded by the Player Characters, which became more powerful at the cost of making their wielder more bloodthirsty. In Touhou Suzunaan ~ Forbidden Scrollery, Kosuzu reading the Night Parade Picture Scroll causes its leaking energies to animate nearby objects as tsukumogami (which are secretly gathered and recruited by Mamizou). In the finale it's revealed that when manifested, the demon in the scroll can consume tsukumogami to grow stronger. The AllSpark was an all-powerful, semi-sentient artifact that created the Cybertronian race. The AllSpark key in Transformers Animated was originally a security keycard owned by Sari Sumdac before the AllSpark transformed it, imbuing it with some of its power, being able to heal and upgrade the Autobots and even some non-sentient Earth machines. It is later revealed that it can also imbue machines with life if under prolonged use, turning Soundwave from a harmless music-making robot into a particularly powerful Decepticon. The same applies to shards of the AllSpark itself when it is shattered in the first season's finale. 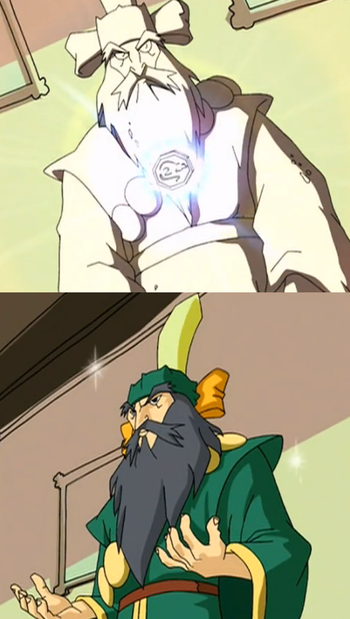 The Heart of Jong from Xiaolin Showdown is a Shen Gong Wu with the power to imbue life onto otherwise lifeless things, imbuing life onto Dude-Bot (one of Jack's robots), Raksha (a monstrous snowman) and Jong (a collection of Shen Gong Wu). Exploited in one Family Guy Christmas Episode, where Lois lights Frosty's hat on fire using a Booze Flamethrower, leaving the snowman to either live in pain or simply become an inanimate snow pile. In Jackie Chan Adventures, the Rat Talisman grants "motion to the motionless"; when attached to a statue or toy, it comes to life with the memories, personality, and powers of the being it represents. The page image is from the episode "The Warrior Incarnate". The Big Bad of Seasons 1 and 2, Shendu, can use the Rat Talisman to transform his statue prison into his original body without needing to break the spell that imprisons him. In one episode where Jackie gets turned into a puppet, the Rat Talisman is used to let him animate and control his puppet body. Gems in Steven Universe have gemstones that create the rest of their bodies. If the gemstone is shattered, the gem essentially dies, but there's enough consciousness remaining to animate any garment they're put into. Steven uses this to bring his clothing as well as a mascot costume to life. Pearl mentions this was once used to create Animated Armor, which inevitable Turned Against Their Masters (which also happens with the mascot costume).